On 31st October 2016, Perbanas Institute hosted a seminar on entrepreneurship in partnership with a local online media publication company, KedaiPena.com which took place at the institute’s Unit III auditorium. The event sought to provide in-depth insights on becoming a renowned entrepreneur in Indonesia through interactive discussions with leading businessmen as well as case studies on retail services for outdoor equipment. A number of keynote speakers who attended the event included Perbanas Institute’s Rector Prof. Dr. Ir. Marsudi W. Kisworo, former Indonesian Coordinating Minister for Maritime Affairs Dr Rizal Ramli, President Director of Sarinah Ms Handriani Tjatur Setiowati, and Director of Cartenz Indonesia and Cozmeeed Brand Owner Mr Surya Kurniawan among other high-profile guests. Coinciding with the country’s Youth National Pledge Day, Perbanas and its partner thus utilised the event as a measure to encourage attendees to partake in entrepreneurship opportunities. In doing so, Indonesia’s young population would therefore be able to showcase their level of competitiveness amidst greater global integration. To further realise this effort, Perbanas Institute signed a memorandum of understanding with KedaiPena.com which includes areas of focus on publications, education, and scholarship programmes; Editor in Chief of KedaiPena.com Mr Ari Purwanto represented the media publication company during the signing ceremony. 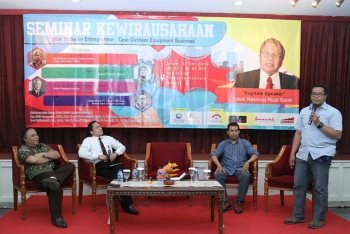 As a higher education institution that is committed to producing graduates with the capacity to initiate concrete change for Indonesia’s economic development, Perbanas Institute is set to continue hosting events that strives to encourage entrepreneurship amongst the country’s young generation.